I had hoped I wouldn’t come out of this show echoing all of the other critics, but unfortunately there’s not much new to share. We have a musical here packed with one-dimensional characters. Everyone is the ultimate stereotype: the bad boy, nagging sister, player best friend, super gay bff, the list goes on. No character ever digs below the surface, and when the writers try to do so with the leads, it only comes off as lame and ineffective. What my companions and I were left wondering was: does the actual idea work? Can you make an entire show based on the premise of a first date? Yes, it’s funny. People easily relate; they can look at the characters up on stage and think, “Ohh yes, I’ve been there.” With the classic highlights of the introduction, small talk banter, no-no’s of first dates, awkward pauses, picking up the check, etc., there is a lot to poke fun at, but is there enough meat to make a full musical? Perhaps if there were more vignettes of multiple couples, rather than just one date, you could find more to work with. I’m not sure, but as it stands, First Date is 90-minutes of mostly filler. The banter is light, packed with easy jokes. My theatre pal, Matt Franzetti, called it sitcom writing, and I couldn’t agree more. Now, let me stress that I love me some quality sitcoms, but I don’t go to the theatre for that. This musical could be a 22-minute sitcom with the main storyline being the horrors of a first date, but since these characters are so over-the-top and archetypal, there’s no way to connect to them as an audience. They seem fake, so when the topics try to steer their way to real connection, I didn’t go along for the ride. I tried. I did! There are a handful of genuinely funny moments, but the rest are forced and uncomfortable. For example, there’s the gay BFF bail-out call. It’s a somewhat funny gag; yes, girls often have a friend call just in case they want to get out of a date. But then he sings the same song THREE times. They take a gag that’s not all that great to begin with and then beat it into the ground. 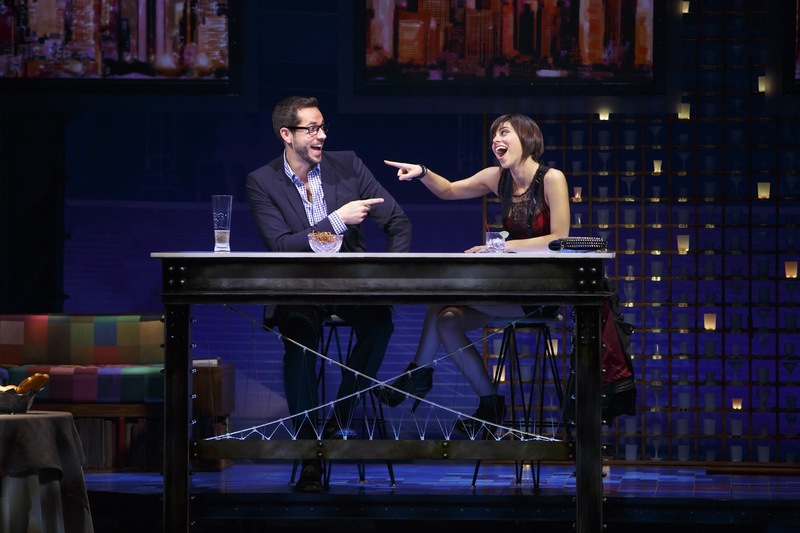 As for the stars, First Date features Zachary Levi and Krysta Rodriguez. We first heard Levi’s pipes in Tangled, and he is a king of landing awkward humor (see: Chuck). He’s just the right combination of awkward and charming to make even the lamest dialogue endearing. But it gets old quick. True, he keeps landing the jokes, but let’s give the guy some variety please. Also, I’m so over the standard stereotypes of guy meets girl: the uptight, tripping-over-his-words guy and the punk-rock, hard-shell girl who deep down is vulnerable and looking for love. And Rodriguez, whom I usually like, is just reciting her lines. It doesn’t feel organic, but can you blame her with some of the stuff she has to say? It’s hard to be so harsh, but between that book, the primarily forgettable score, and the marketing, I just can’t get on board with this show. First Date will definitely be my last.